King Virata was very happy to have won the war against Susharma and Duryodhana. He came to know that the five Brahmins who had helped him protect his kingdom were none other than the brave Pandavas. He was very grateful. He also came to know that for one year Arjuna had lived in palace as a servant where he taught music to his daughter, Uttara. He was overwhelmed with gratitude and said, "Brave Arjuna, please accept my daughter's hand in marriage." Arjuna replied, "I have been your daughter's teacher, I am like her father, I can't marry her. Instead of me marry her to my brave son, Abhimanyu." King Virata's joy had no bounds. Arjuna called for his son who was at that time in Dwarka. The wedding was celebrated with great splendour. 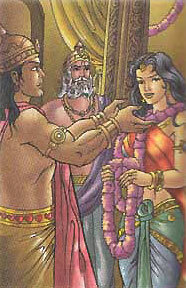 Abhimanyu's mother, Subhadra; Abhimanyu's uncles, Krishna and Balarama; also graced the occasion.